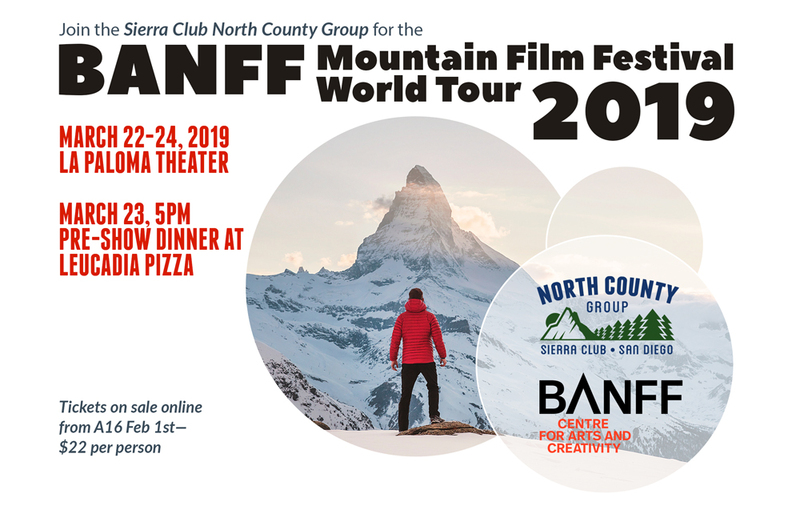 Banff Mountain Film Festival World Tour 2019 | North County Group – Sierra Club S.D. The Banff Mountain Film Festival World Tour 2019 is coming to Encinitas in March, a showcase of the best action, travel & adventure films! There are three different nights of Banff Mountain Film Festival programming, as there have been in years past: Programs A, B, and C. If you can’t get tickets to the La Paloma showings, there are a couple of other locations where you can view the films. For more info click here. Tickets go on sale Friday, February 1st at 10:00 am. They can be purchased online or in-person at the Adventure 16 San Diego location (please note that the A16 Solana Beach location has closed). Act quickly to get your ticket! They will sell out fast! Join North County Group for dinner before the show! We will be gathering at Leucadia Pizza at 5:00 pm on March 23rd for dinner before the viewing. Leucadia Pizza is just a short walk from La Paloma Theater, where the film festival is taking place.